Overlooking the beautiful Ayung River, the hotel is conveniently located at Kedewatan in Ubud, a famous village in the middle of Bali, approximately an hour-drive from the Bali Airport. 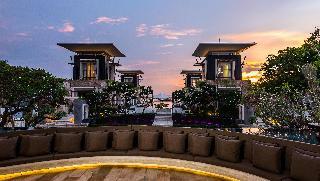 The hotel has created a unique yet traditionally sensitive Balinese style of architecture and culture. All rooms nestle amongst a series of steep embankments downhill with breathtaking view. The hotel offers two dining establishment with stunning view. The accommodation has thatched grass roof and traditional Balinese door. Each one offers a private swimming pool, large marble bathroom with luxurious amenities and sumptuous toweling. All air-conditioned rooms feature television, IDD telephone, and personal safe. The library offers a wide selection of books. The hotel also offers a wide range of customized body and beauty treatment. 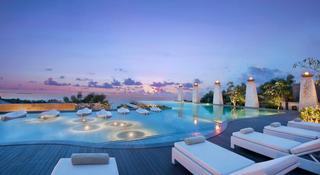 This resort is set just off one of the most vibrant streets in the energetic area of Seminyak. 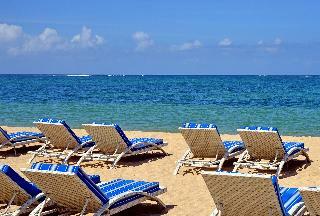 The resort is located within convenient walking distance of a host of popular restaurants, cafes and bars. Guests will find themselves just a 5 minutes' driving distance from Petitenget Beach. 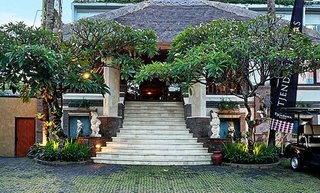 Basking in its prime setting at the heart of Seminyak, the resort is encompassed by the rich culture and history of this mesmerising region. The resort comprises elegantly-appointed villas, which are set within a walled area. 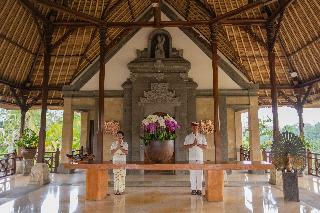 The villas feature traditional Balinese influences, as well as creative pieces of art by local artisans. This wonderful resort invites visitors to avail of the host of facilities and services that it has to offer. Guests can enjoy a delightful breakfast in the mornings, before setting off to explore the essence of Bali. Tjendana Villas Nusa Dua provides an ample space that is suitable to accommodate family or groups of friends in the Two-Bedroom Pool Villa and Three-Bedroom Pool Villa or One-Bedroom Pool Villa for honeymooners to be spoiled in their ultimate romantic escape in a prime location of Nusa Dua peninsula. Only 15 minutes from Ngurah Rai International Airport and within short driving distance to shopping centers, restaurants, enchanting beaches for water activities to embrace the beauty of Bali's marine life as well as to enjoy the magnificent water blows, some entertainment spots for a spectacular contemporary acrobatics with dance performance where our Guest Service Assistant at Tjendana Villas Nusa Dua will be happy to assist you to arrange your exciting activity schedule during your stay. With 2 beautifully landscaped pools with sunken bars, luxurious beachfront stays await at Padma Resort Legian. Featuring 7 dining options, it provides free access to a departure lounge and fitness facilities. Boasting views of tropical gardens, 5-star rooms feature private terraces and flat-screen TVs. Padma Bali's pleasant rooms offer the comfort of classic wood furnishings with Balinese touches and a DVD player.For leisure, enjoy a game of tennis or relax with soothing massages at Mandara Spa. Shower facilities and free refreshments are available at the departure lounge. Have a hearty buffet breakfast or sample Indonesian specialities at Donbiu, which also offers live entertainment. Other dining options include Italian and Japanese restaurants, as well as 3 bars. Situated in Bali's vibrant, upmarket Seminyak area, this splendid resort offers a range of luxury villas for a spectacular island getaway. Guests will find a variety of boutiques, spas, restaurants and clubs in the surrounding area, and the airport is just a fifteen-minute drive from the resort. Seminyak beach, calmer and less crowded than the more famous Kuta Beach, is only a fifteen-minute stroll away.The spacious and airy villas boast the perfect combination of sleek and modern designs with rich, traditional Balinese themes. Each features a private deck with a Jacuzzi or lavish plunge pool where guests can escape from the hustle and bustle of the city as well as an LCD flat-screen television and internet access in order to stay connected to the outside world. 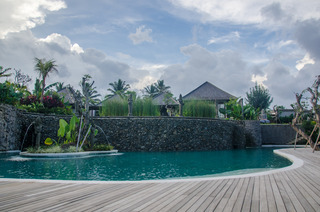 The resort also offers in-room Balinese massages and meals prepared in the villas, 24-hour butler service, and chauffeur services, all for an indulgent, relaxing holiday.